Are Web Design & Web Development The Same? How Do Web Designers Charge For Their Work? Who Are The Best Web Designers In The World? A web designer – under the direction of an art director – designs the outward facing interface of a website. When creating a website, an information architect designs the layout, format, and structure – called the wireframe. Then, a website designer takes that wireframe and adds colors, images, and typography, typically in Photoshop. Once completed, website designers will present their designs as static images to the clients. After they are approved, they move into the web development phase. Web designers are often confused for web developers – the professionals who write code and build the website. However, a website designer is more like a graphic designer rather than a software developer. In short, no. Web design and web development are two different aspects that work together to create a custom website. Website designers are more like graphic designers, inputting the aesthetics that a website will have, including creative fonts, imagery and colors. After the layout and structure of the website is determined and the website designer graphically designs the user interface, the project moves into development. Here, a website development team will write in code to build the website and its features. Although website design and website development work hand-in-hand, they are two different processes with two different skill sets. Charging employees by the hour is the most common form of invoicing. If you’re hiring a top web design company in the United States, that could cost you $100-$175 per person per hour of work. Overseas, those experts’ fees tend to be less. Expect closer to $55-$75 per person per hour for professional companies outside of the United States. Per project invoicing is beneficial for brands that need a variety of separate website projects created. Agencies will simply bill per platform built, and count each project as its own standalone invoice item. For results-based billing, agencies and clients will determine specific key performance indicators that need to be reached in order for payment to be issued. Determine which type of website you need and the objectives you’d like to reach through your site to find the best website designers that specialize in exactly what you need to succeed. Before you begin meeting with agencies, determine the amount that you are truly able to spend on your website. Provide a return on investment. Experience solving similar business problems. Incorporating innovations, trends and ideas. Pro Tip: The most important quality to look for in an agency’s case studies is their experience solving similar business growth problems as yours, regardless of industry. Take the time to understand how a web design agency creates an organized process and ensures you receive an ROI. Who will be working on your team, what their qualifications are, and how much time will be dedicated to your project. Who your point of contact will be. What the key performance indicators will be and how often they will be tracked. How often you will have meetings, calls and receive reports. How long the best web design company will monitor your site’s performance. The following questions will help you understand every one of an agency’s offerings and help you decide if they are the right fit to grow your business online. Who will be working on the project and what is their experience? What web design, development or additional services do you offer? How do you stay in-the-know about the latest trends? Can you share some successful case studies and portfolio items? Why were they successful? Do you have any experience in our industry, market or solving a similar business problem? What is the organizational process of a website design project? Do you incorporate SEO optimization in website projects? Do you have an in-house expert? How often will you measure results and what metrics will you use? How much do your services cost and should we expect any additional fees? Do you offer long-term support and maintenance after the site goes live? The ability to understand a brand and collaborate well with them. Experience solving relevant business growth problems online. Technical and creative expertise in web design, development, SEO and more. A portfolio filled with successful case studies. A clear pricing structure that enables a return on investment. An organized process for creating project timelines, deliverables, and key performance indicators. A variety of web design and development services. In-depth knowledge about the latest trends. Luckily, DesignRush lists some of the top web design agencies from around the world. Check out the table above and compare website design company rates, team leadership, case studies, ratings, reviews and more. Artificial intelligence in web design encompasses chatbots, machine learning and automated personalization. Since 75% of consumers are more likely to purchase from a website that remembers their name or can suggest potential purchases to them, AI is a web design trend you should invest in, stat. 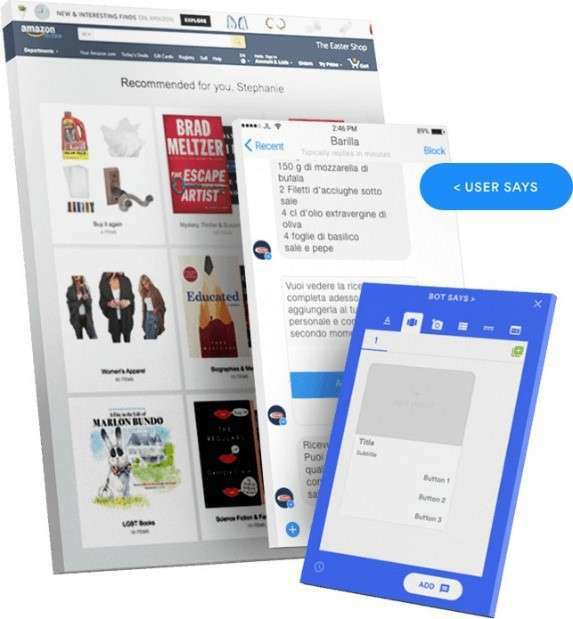 Amazon, the reigning king of e-commerce sites, is the site that does machine learning right. 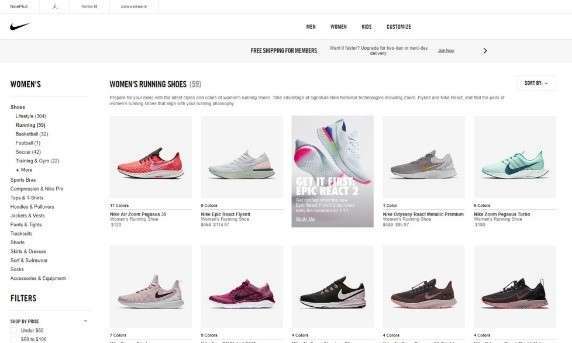 They offer suggestions to users across every page of the e-commerce website, allowing users to find products quickly and easily while also discovering new items that are tailored to them. Their success is reflected in the numbers -- Amazon saw a total revenue of $177.9 billion last year, and that number is projected to grow in 2018. If you’re hoping to replicate some easy personalization yourself, try Molly by The Grid, an AI web designer that can adapt your site to what your consumers want, or BotSociety for a simple chatbot interface that is easily integrated and can improve customer service. 77% of marketers saying creating a recognizable brand identity is crucial to a company’s success -- and an unexpected web design layout can achieve this! Everything from asymmetrical layouts to free-form design to brutalism fit this aesthetic. When implemented correctly, they can add depth and motion to a website design. To pull interesting layouts off, you have to know your visitors well. Will they appreciate an unexpected design? Are the rest of your design elements, such as checkout or navigation, intuitive and easy to use to counteract the unexpected appearance? In addition, big design risks should be balanced with strong user experience and tried-and-true trends so as not to scare visitors -- particularly first-timers -- off before they can convert. The Outline incorporates the brutalism web design trend to add plenty of personality. Brutalism -- which can be unpolished, purposefully clunky and, well, just plain extra -- is seen in the wildly contrasting colors, bold serif type and the pop culture icons that adorn article headlines and menu items. However, The Outline combats all this with an easy, intuitive web design. Color psychology -- aka the art of leveraging the emotional and psychological responses to certain colors -- can drive website conversions. After all, the majority of consumers are more likely to engage with a company if they feel some sort of emotional connection to it. What's more, consistent colors can increase brand recognition by up to 80% -- and consistent, recognizable brand presentation across all platforms, including websites, further improves conversions. But exciting colors don’t have to come in the form of flat designs and static backgrounds. 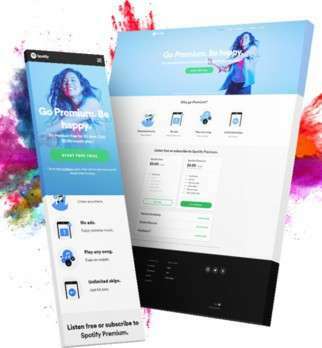 Make them unique with gradients, layovers or duotone effects, which Spotify employs on many pages, including their Premium landing page splash image. This color effect -- which fittingly uses that popular ultra-violet purple -- helps a bright green call to action button pop off the screen. However, Spotify smartly avoids overwhelming the user by introducing negative space above the fold to create a pleasing contrast. Your site only has 17 milliseconds to impress consumers. This means that your website design has to be fast, user-focused and have a special “wow factor” that pulls visitors in. What better way to catch someone’s eye than a little motion? Videos within web design can increase conversions and motion graphics, in general, can help companies grow up to 49% faster. Motion cultivates a concrete brand identity, and draws attention to important information and calls to action, such as a purchase button or email signup. Ultimately, videos and animations on your website design can help you explain, promote and cultivate emotion in visitors, according to Forbes. Heystack capitalizes on motion graphics to signify their expertise. 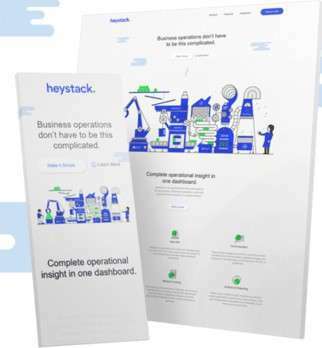 Upon landing on their homepage, users see an animated well-oiled machine, labeled with many of the programs Heystack supports, working together to churn out a successful project. Website design isn’t all conversions and calls-to-action. There needs to be a little humanity in there to give your brand a voice that people will gravitate towards. An easy way to achieve this (and increase brand consistency) is through hand-drawn illustrations. 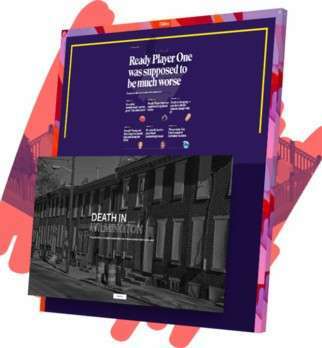 Tatyana Khamdamova, head of design at Blue Fountain Media, encourages her team to take tiny elements like illustrations and incorporate them throughout a website design. This helps every page reflect the brand -- even if the logo isn’t visible. In addition, custom illustrations can foster an emotional connection with customers -- and 65% of consumers who feel an emotional connection believe a brand cares about them personally and subsequently cultivate a long-term bond. 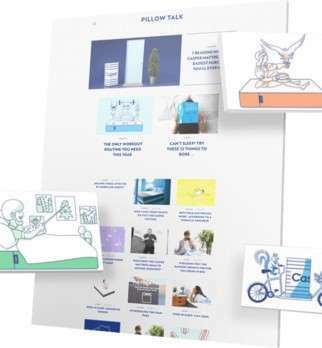 Buzzy mattress startup Casper is known for its playful, cartoonish illustrations -- and implementing them across their website helps to create a consistent brand. It gives the company a lighthearted tone, ties in their company blog, and even gives them content for marketing campaigns, such as their now-iconic subway ads in New York City, from design agency Red Antler. A clean, minimal design allows users to focus on the message a brand is communicating. This ultimately fosters a better relationship between consumer and company, which is shown to increase sales. In fact, 64% of consumers say that shared values are the main reason they trust and maintain a relationship with a brand. Simple web designs also cultivate a stronger, longer lasting brand identity. Take Nike for example. The sportswear powerhouse is easily identified by its iconic swoosh, which represents the Greek goddess Nike, a symbol of victory. The logo design is uncomplicated and minimal, and this simplicity is reflected in all other Nike brand platforms, including the website. The site is permeated by plenty of white space, an organized grid system and thin sans-serif font in black, all of which mirror the aesthetic and quiet strength showcased in the logo. 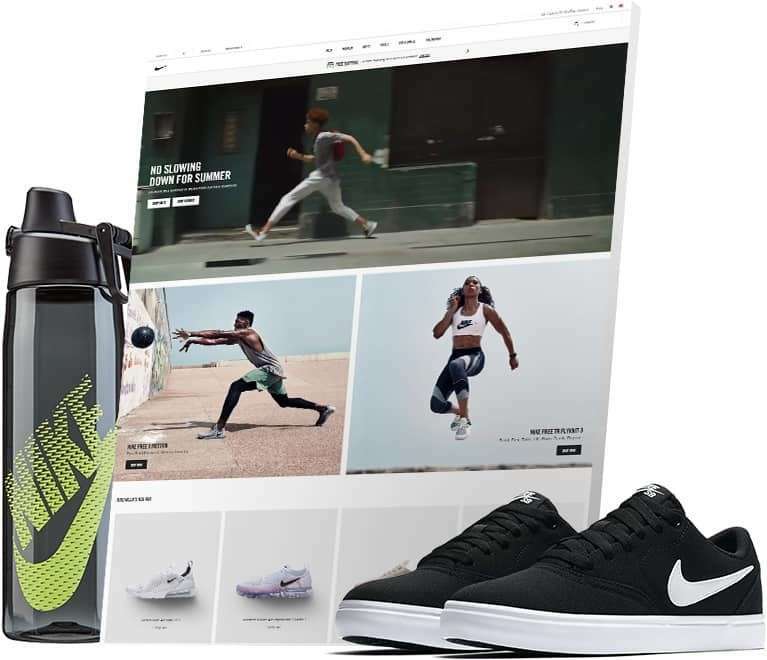 However, a minimal website design does more than further their brand identity -- it also gives Nike the flexibility to adapt to trends without committing to them. Ultimately, minimalism gives brands the freedom to adapt while simultaneously fostering a recognizable identity, which is why this longstanding website design trend is still going strong. More than 90% of website visitors who read your page’s headline will also read your call to action. In fact, a case study from Brafton found that consistent and informative calls-to-action improved e-commerce conversion by 22% and overall revenue by 83%, proving that a little persuasion can go a long way. But the wording is important, too. Studies show that more personalized, friendly calls-to-action consistently see better click-through rates. What’s better? Ingratiate yourself with users more by writing in first-person. This will transform your online interaction with potential customers from transactional to personal, increasing the likelihood that they will make a purchase. 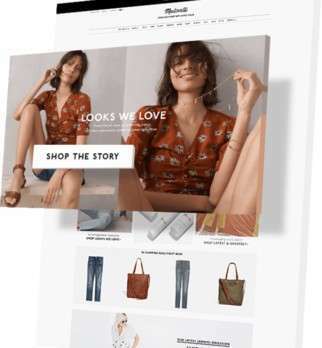 Madewell places plenty of calls to action across their e-commerce website, from shopping cues to newsletter signups. While the CTA featured above is an email popup (which also showcases their brand’s tone, too), many other subtle prompts are found on every page. These CTAs pay off well, too. Despite being owned by a struggling J.Crew, Madewell’s revenue continues to increase. The second quarter of 2017 alone saw a revenue of $93.1 million. 77% of agencies believe that subpar user experience is a weakness for their clients -- and one of the largest factors in user experience is poor navigation. Unfortunately, studies show that discovered that users like to quickly and easily find information about the company, products and services. In addition, 50% of users look to a navigation menu to discover where they are on a website when they arrive from a referral. Easily improve user experience on a website by creating intuitive navigation -- after all, visitors landed on their site because they want to find something. Why not make it simple for them? 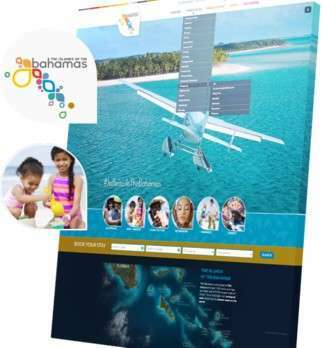 The Island of the Bahamas’ official website features truly intuitive navigation. Everything from activities to specific hotels are easy to find, and each menu item is clearly labeled, with subheads that can break down a visitors’ search even further. While it may not be the most Earth-shatteringly exciting site on the world wide web, this design is truly focused on the user. 64% of visitors want to find a contact page after arriving on a website. But is it really that detrimental if you don’t have one? The simple answer is yes. Simple contact forms with three fields have a minimum conversion rate of 25%. Plus, when 42% of consumers are distrustful of brands with poor communication, a contact us page becomes even more critical. 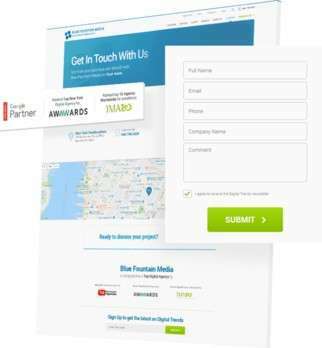 Top website designs that give users what they want will always have a contact page -- and you should, too. Service-based companies in particular, such as digital agency Blue Fountain Media, benefit immensely from clear and simple contact forms. The small form, readable text and clear messaging make this the perfect catch-all for potential clients. Other sites benefit from contact pages as well. E-commerce sites can strengthen customer relationships by answering questions through a contact form, while informational sites can field suggestions, allowing users to feel more engaged and understood by a company. 91% of marketers utilize some form of content marketing to boost a brand’s awareness and bottom line. Plus, content marketing creates more than three times as many leads as traditional marketing -- yet it costs 62% less. The good news is that content marketing isn’t all just fluffy blogs or long-form content. Anything from white papers to videos to social media can all constitute content marketing -- so long as it’s telling your business’s story in some way or informing your consumers on topics they care about. In addition, content marketing initiatives hosted on your website can be integrated into many platforms, such as email marketing campaigns and social media posts, ultimately driving more traffic to your website. Finally, content marketing helps websites rank better in search engine listings for applicable keywords, making your business more discoverable for new customers. Furthermore from Equinox is a stellar example of content marketing done well. 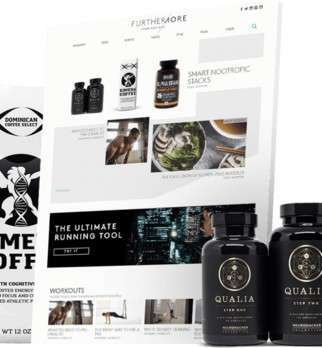 This standalone website is actually the content brainchild of the luxury gym Equinox. They subtly yet frequently promote both their locations AND the Equinox lifestyle -- healthy, chic and elegant. It’s a tricky yet effective ploy to strengthen their brand identity and organically capture potential gym-goers that fit their demographic. According to Adobe, 38% of users will just stop interacting with a website if the layout and content aren’t attractive. But a beautiful design on just one medium won’t grow your company. Instead, you need to invest in a consistent design across all pages and mediums. It turns out that users want to trust the companies they give their business to, and a great web design that matches the image they product on social media, print ads, apps and partnerships fosters that. Need a little inspiration? Look at Apple. They have spent decades cultivating an image of simple authority across every platform. From their iconic apple symbol (complete with a missing bite) -- which marks every product and post -- to their minimal website design, sleek product pages and seamless checkout, they put the user first while reassuring them that they’ll be taken care of by a reliable brand. 2019 is all about big personality and bold design, and the nostalgic influence of the 1980s and 1990s is propelling this forward with more emphasis on geometric shapes, patterns and textures over flat design. This web design trend doesn’t just boost a site’s aesthetic appearance, though. It can strategically draw attention to important information, featured products and calls to action. Plus, repetitive and symmetrical patterns create the illusion of movement on the site, which, we all know, increases those oh-so-precious conversions. 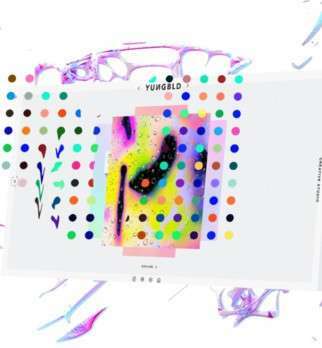 Creative agency Young Blood layers images and patterns to create a stacked texture on their homepage that drives the call to action directly below. This texture is surrounded by white space and minimal navigation menus to keep the remainder of the landing page easy on the eyes. People will believe anything they read in a chart -- or so says a scientific study from Cornell University. It turns out that the appearance of science is just as compelling as, well, science itself! So why not capitalize on that and add the appearance of science to your website design. While you definitely shouldn’t fudge numbers or fib about your services, showing that information instead of saying it will likely resonate more deeply with your consumers. After all, about 90% of the information sent to our brain is visual, which means noggins are well-versed in processing imagery over text. 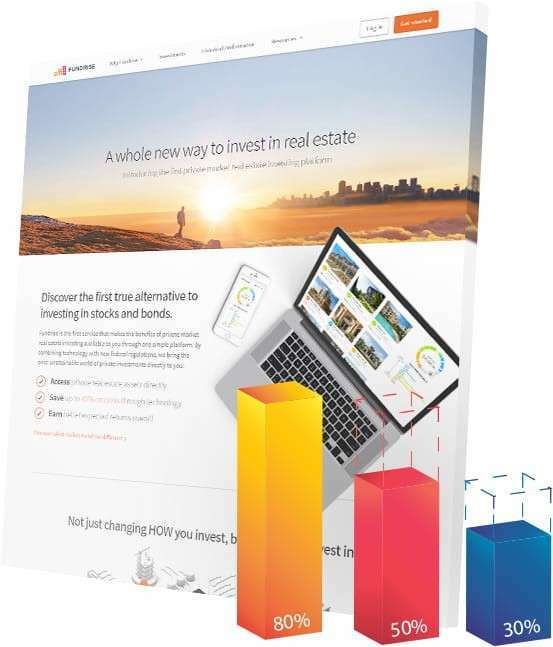 Real estate investment startup Fundrise incorporates charts and graphs perfectly into their website design. Upon landing on their homepage, you’ll see a branded chart detailing the success of investing. Hearing them say there’s a good ROI is one thing -- but seeing the upward trend is effective. Note that not every piece of information is in “science form” -- this is strategic and ensures only the most important information stands out and catches visitors’ eyes. 65% of consumers say that they are more likely to give a brand their business because they feel a connection to the company -- and typography can influence this. Many fonts are impactful due to culture significance -- such as art deco and the roaring ‘20s. Typography can also strike a chord in our semantic memories -- this is often seen with the font Helvetica and government associations (did you happen to notice it on your latest tax forms?). Fonts can also create an overarching vibe. For example, a thin, clean and capitalized font is chic, while a scrawling hand-drawn type is viewed as intimate. Le Cafe Noir Studio unlocked this with their horror film-like font. While the majority of the website is a minimal grid layout with colorful clothing images, this unique branding adds an extra layer of depth and personality to the brand, allowing the e-commerce site to appeal to its demographic -- fashionable women with creative personalities -- with more punch. What’s more? By only utilizing it in the logo branding, it actually strengthens how uncommon and interesting the typography is. A 0.5-second delay in loading time can result in a 20% decrease in traffic. If loading times are delayed, visitors can develop interstitial anxiety, causing them to wonder if something is wrong with the site. But this anxiety can be reduced with the use of creative loading animations or interesting page transitions. Interesting transitions also boost UX by creating a seamless experience. According to Forrester, a strong interface design can increase conversions by up to 200%, and strong user experience design can improve conversions by up to 400%. 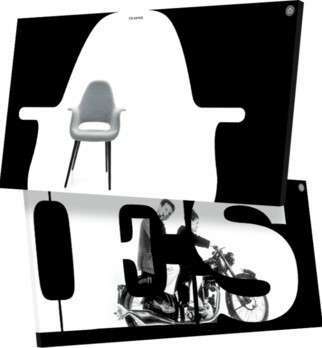 The Eames by Enso married unique page transitions and with a single-page site to create an engaging experience. There’s no clicking and no menu -- instead, you can scroll your way through the site, which moves both horizontally and vertically through the predetermined path. These unique page transitions add motion graphics -- such as a mask header and products that swell and reduce in size in conjunction with the scrolling -- to take users through a compelling timeline-like journey. This places emphasis on information like dates, products and life achievements that the readers should take note of through simple motion. Optimizing for mobile isn’t really a web design trend -- it’s an absolute necessity. Mobile e-commerce sales are expected to account for nearly 40% of all online sales in 2018, and that number is expected to grow to 53.9% by the year 2021. In fact, Google places an even higher emphasis on mobile optimization vs desktop when it comes to search engine rankings. To get yourself closer to that coveted no. 1 spot, create a responsive design and ensure the loading time is quick – 53% of mobile sites are abandoned if they don’t fully load in three seconds. 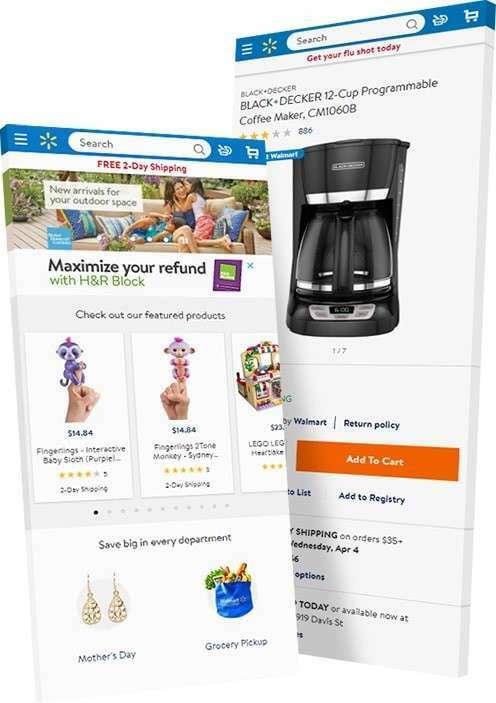 Walmart is a stellar example of an e-commerce website design that is well-optimized for mobile devices. The quickly-loading site features a prominent search bar and a left-side hamburger menu upon landing on the home page. The shopping cart is easily accessible on the right-hand side throughout the mobile experience. When you navigate through the site on mobile, you can easily sort, filter and access your shopping cart. The minimal sunburst-like symbol found within their logo design is also seen upon arrival, branding the site with consistency without taking up too much real estate. This shows the effectiveness of responsive logo design. A cohesive, functioning and beautifully designed site can be the determining factor on whether or not a consumer will complete a purchase or an investor will make an offer. Aligning your business as a leader in the industry. Are you ready to improve your brand’s online presence? Check out DesignRush’s list of web design and development agencies above!